Continiung on with the catch-up posts due to the blog issues I was having last week, I’m sharing with you the open face grilled tuna salad sandwich I made from our delicious Farmer’s Market finds. I’ve had this sandwich before (Dan’s parents are big fans and have made this for us), and it tastes so good every time I have it. I’m wondering why I don’t make it more often. 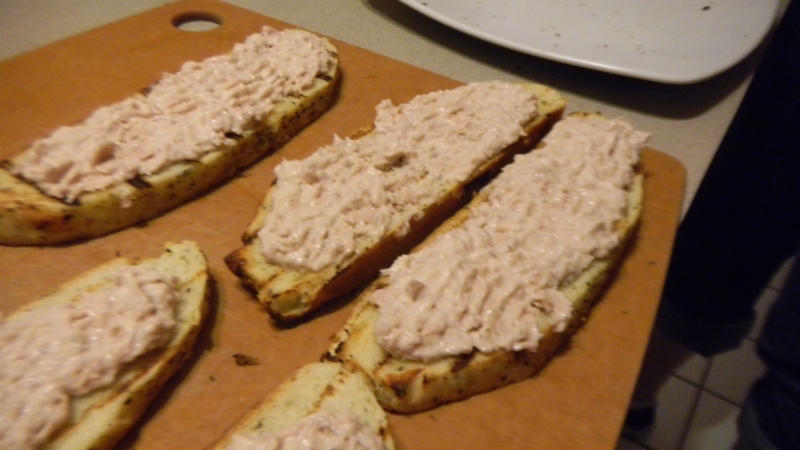 Start by making tuna salad as you usually do. I prefer it with mayo and celery to give it some crunch. Once you have it made, set aside. 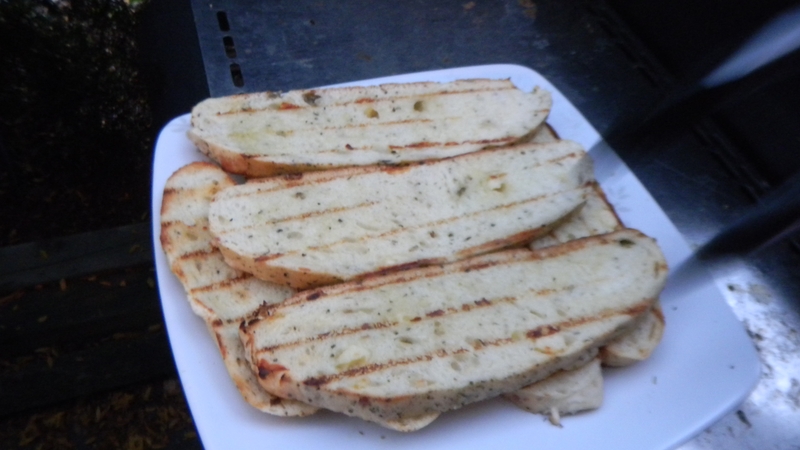 Next, start up your grill and brush olive oil onto sliced pieces of bread. I have to warn you, I don’t think there is any bread better than the kind we have. It really makes the sandwich. The bread is from the Wheaton French Market, which is a Farmer’s Market. 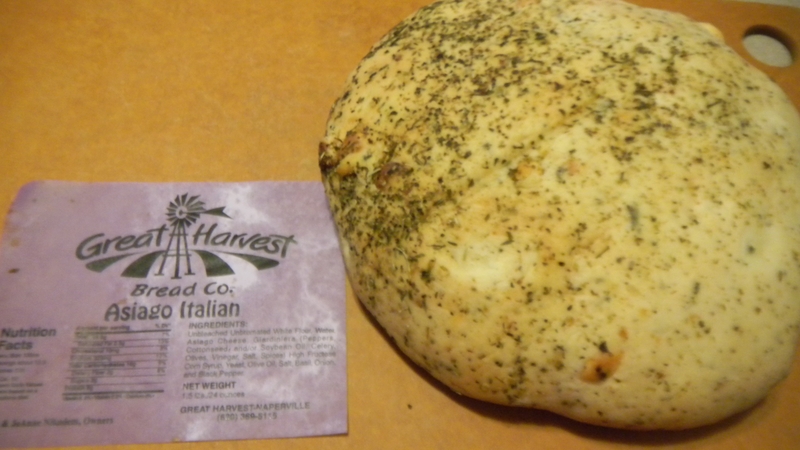 The bakery itself is Great Harvest Bread Co.
Once the pieces have been oiled, put them on a hot grill. It only takes a couple minutes to get each side nice and toasted. Add the tuna salad on top of the grilled piece of bread and anything else you might want on there too (cheese, tomato slices, etc.). 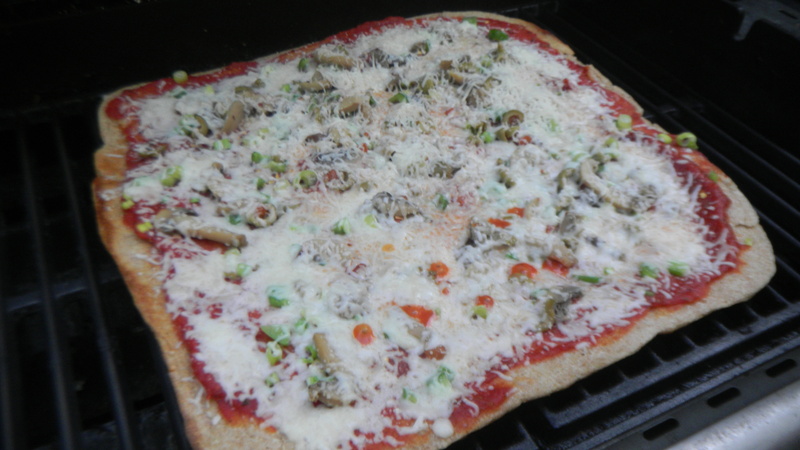 If you want to melt the ingredients, put the sandwich back on the grill for a few minutes. I skipped that step. We ate it with some fresh sweet corn (also from the same Farmer’s Market) that was tossed on the grill at the same time as the bread. 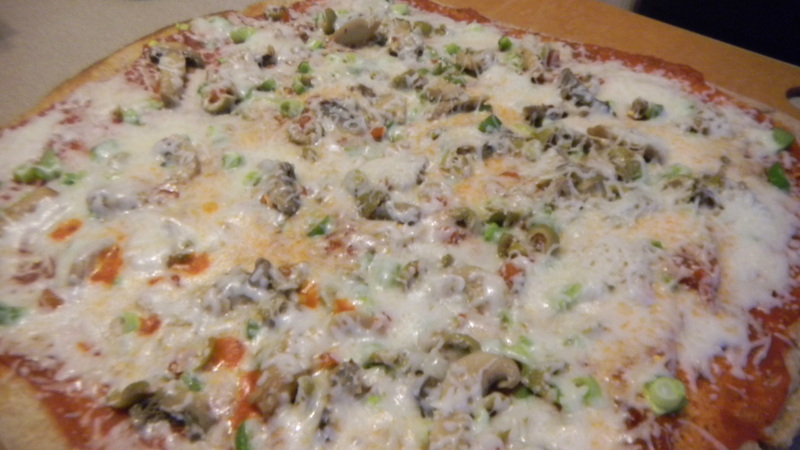 A light warm weather dinner that is sure to please. 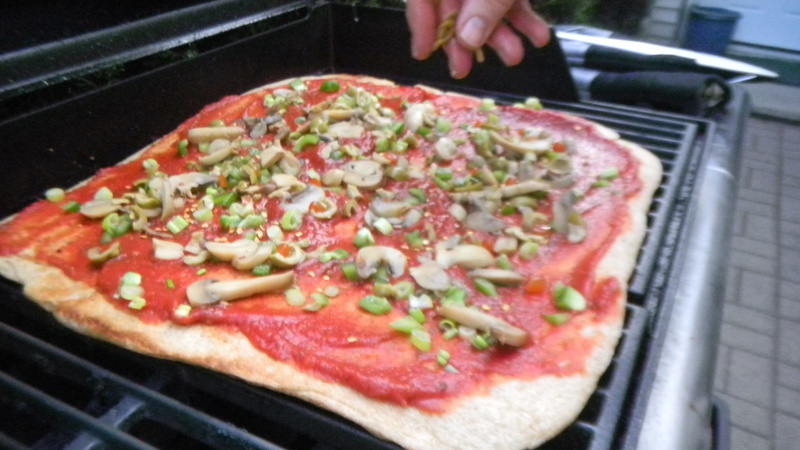 When it’s hot out, I do everything I can to keep the meal cooking outside on the grill. 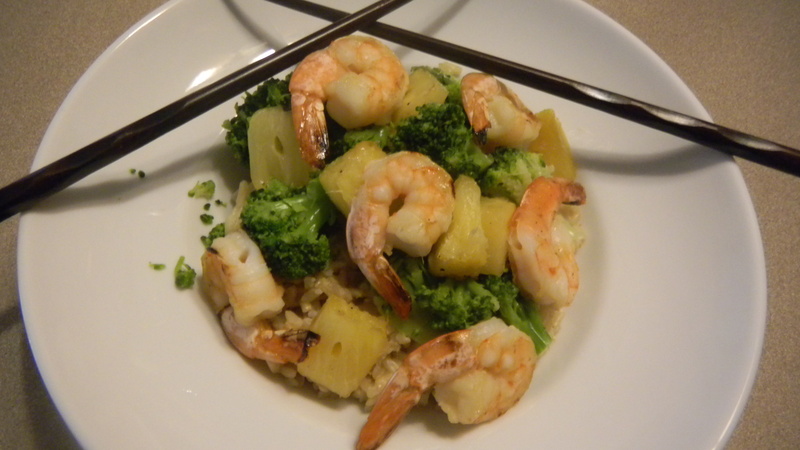 This dish has quickly become one of my go to dinners when it’s just too humid to turn on the stove. I use this recipe from Everyday Food by Martha Stewart, but sub in pineapple for the mango. Not that I don’t like mango, it’s simply that I have canned pineapple on hand way more often than I have fresh mango in the house. 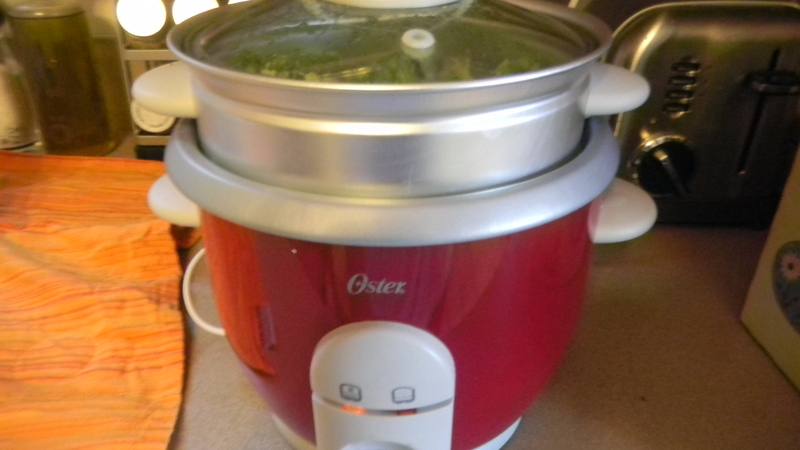 Additionally, we had extra broccoli laying around, so I steamed it in our rice cooker while the rice cooked. It’s pretty easy. 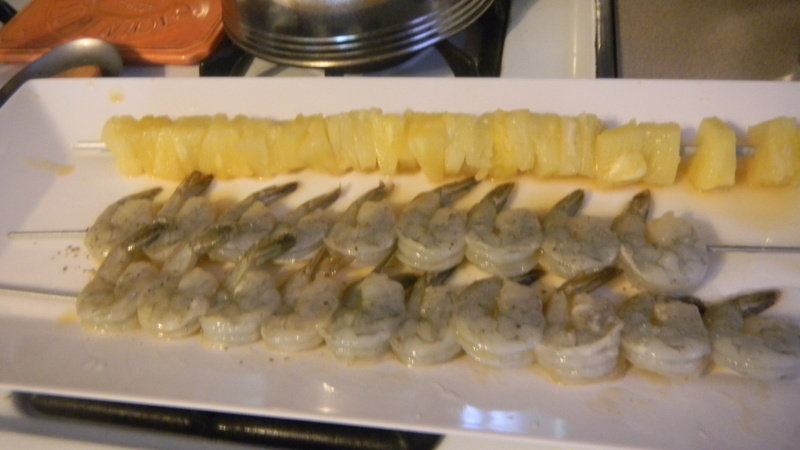 Just start by skewering the pineapple and shrimp. 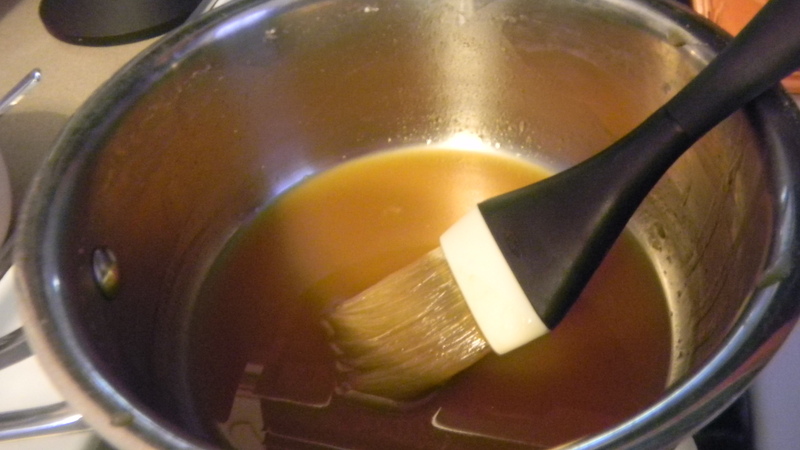 I did have to use the stove to make the rum glaze, but it didn’t take long, so the kitchen didn’t heat up too badly. 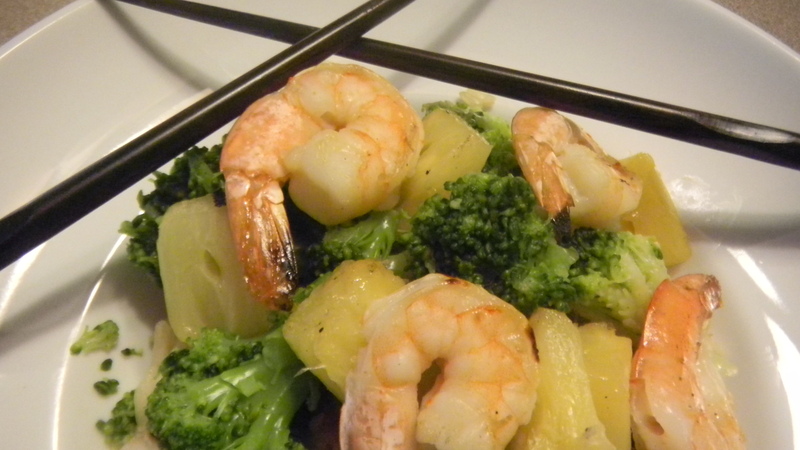 I brushed the shrimp with a medium coating of glaze, and Dan continued to put glaze on while shrimp grilled. In the end, we ended up making a sort of rice bowl with the food. You could just eat the shrimp kabobs on their own with a salad or other side dish though. Whatever’s easiest and whatever you have in your pantry, I say. Making this dinner could not get any easier. And it’s good for you. Doesn’t taste so bad either. Try it out. Just like we buy a huge bag of frozen chicken at Costco, we do the same for salmon. The hardest part of this meal is remembering to thaw it in the morning for dinner that night. Once it’s done, pour about 3/4 of the mixture into a large freezer bag and add four pieces of salmon. Shake it around a little bit, then put it all in the fridge. 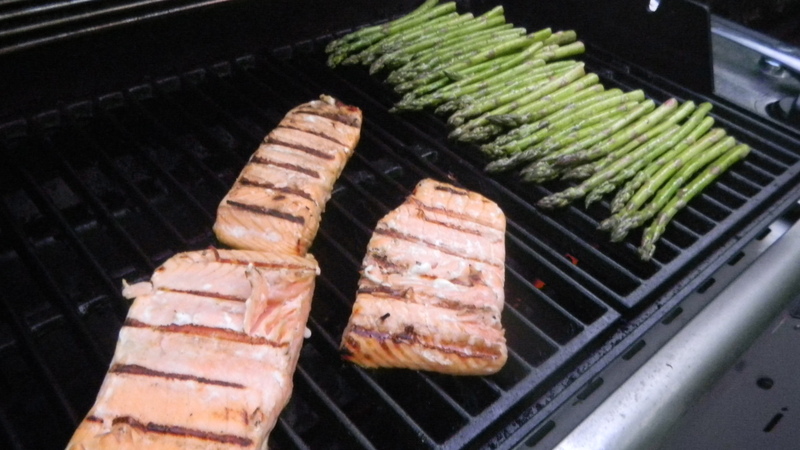 The best part is that the salmon are ready to grill in only fifteen minutes. Talk about a quick last minute dinner! 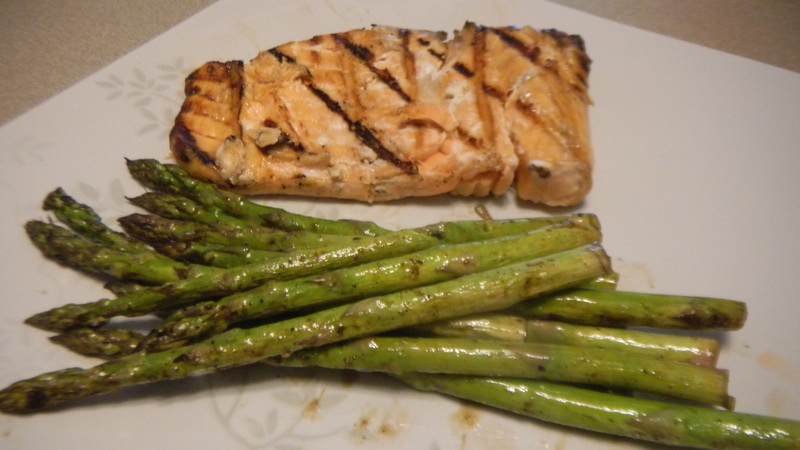 While the salmon is marinating, I washed the asparagus and cut the ends of off each of them. 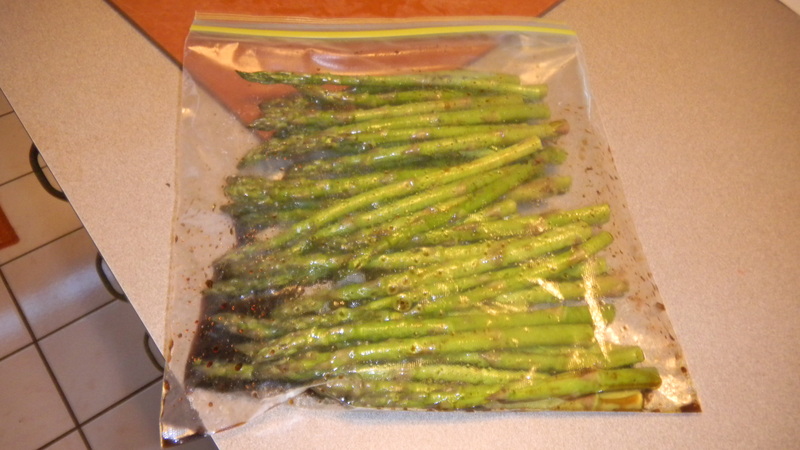 I put them all in a different freezer bag and drizzled in olive oil, balsamic vinegar, salt, and pepper. No measuring, just pour it in there. 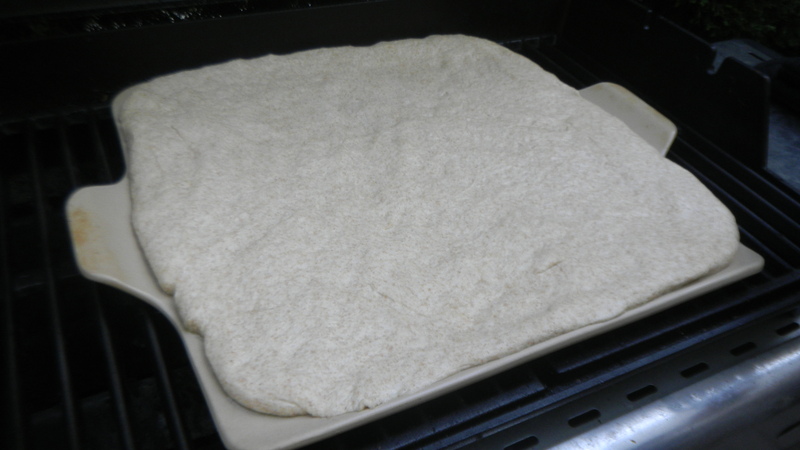 I shook it around and let it sit for about ten minutes, turning them after five. Next, fire up the grill! Dan cooked the salmon for about fifteen minutes total. 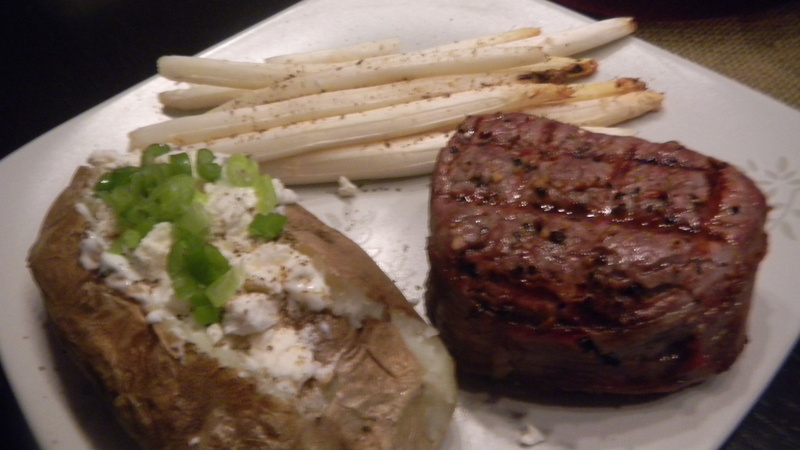 The asparagus cooked pretty quick, you’ll only need about five minutes, so put that on the grill last. Just put it directly on top of the grill grates. Once the salmon and asparagus are done, serve immediately. I really enjoy the Pioneer Woman. I read her blog every day, and I drool whenever she shows pictures of her Lodge kitchen. The other day, she had a post that really struck a chord with me. 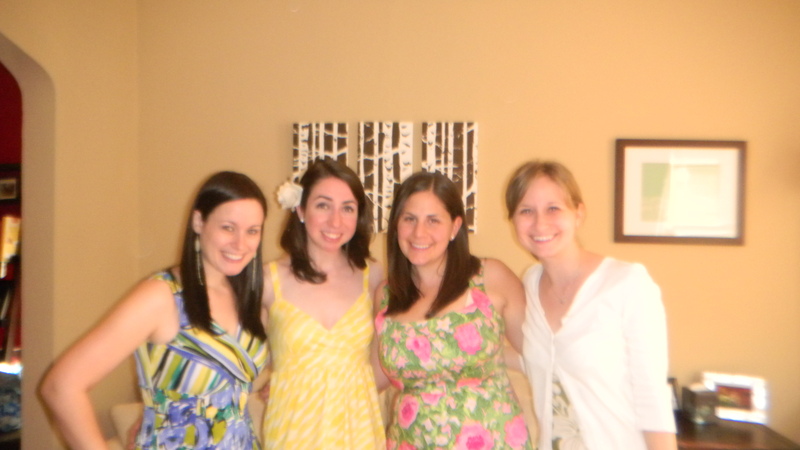 Every year, she hosts some of her oldest and dearest friends for a weekend of catching up and general girly fun. I host a similar gathering for my friends, and so I thought I’d share my experience with you. In the summer of 2007, my friends and I started a tradition. It was the first summer we realized we were all back in the same city, after being scattered around for a few years. 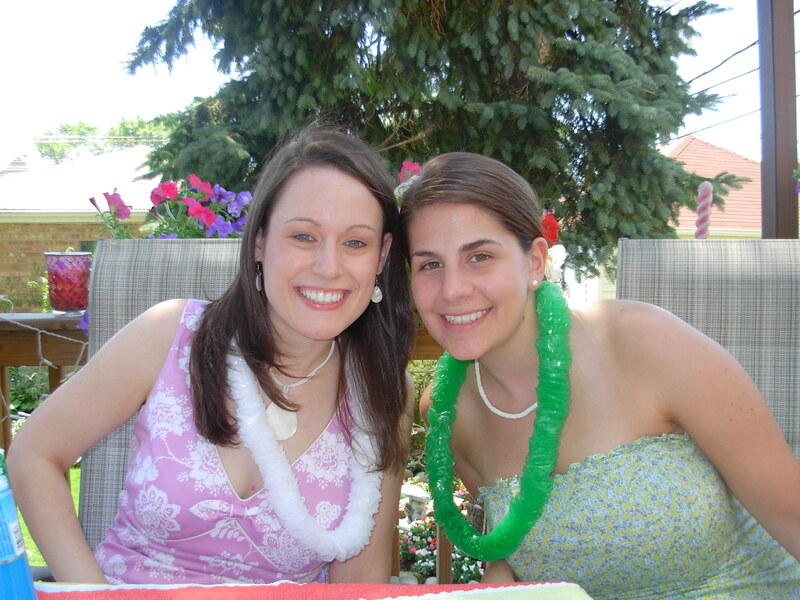 My friend Liz and I were the organizers of the event, and we decided to throw a Hawaiian Luau. We all wore our best Hawaiian gear. Sir Tommy Bahama would indeed be proud. Gosh, we look like babies! It’s become a yearly tradition as a sort of summer get together for our entire group. 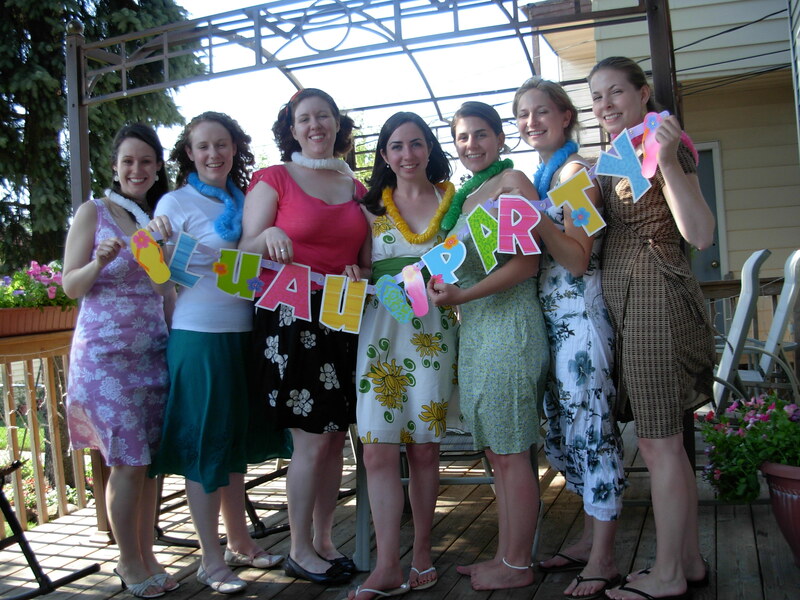 Through the years, the guest list has changed, and there have been years where not everyone in our core group of friends could make it, but still, every year, there was a luau. 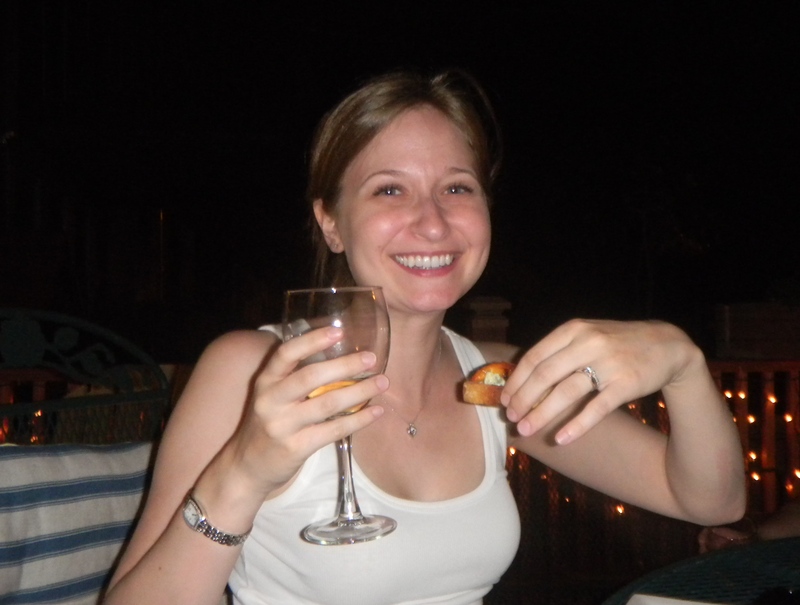 I remember one year, it seemed nearly impossible to find a date that worked for everyone, so we chose to meet on a Friday night (the luau was usually held on a Saturday). There was a powerful storm that night, so there were only three of us there. I don’t even think I dressed up, and just wore jeans and a shirt with a mermaid on it. And I believe the appetizers consisted of nothing but frozen pizza and other frozen items purchased in bulk at my local Costco. I know, classy. No wonder we didn’t take any photos. We had the 2011 Luau last weekend. We kept it small, with just the four of us attending. We also changed it up a bit. This year, I thought we were a little bit passed the cheesy Hawaiian Luau theme. 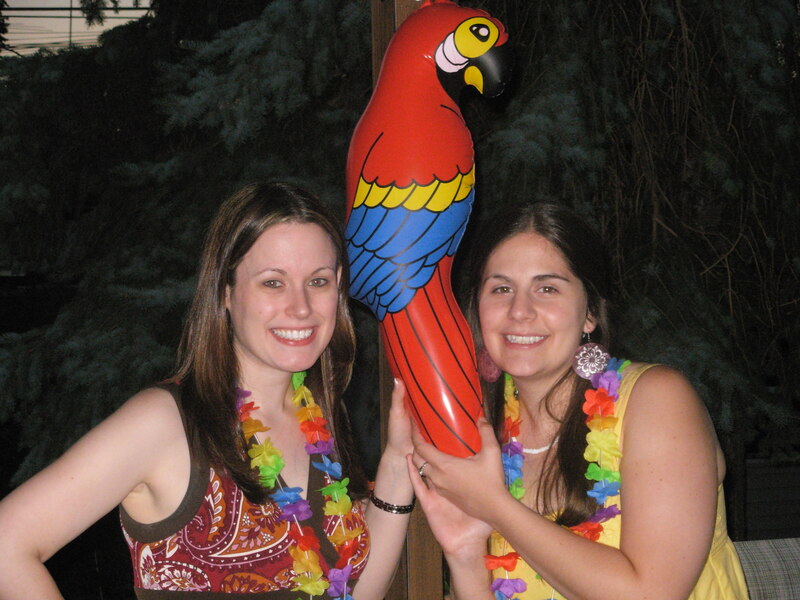 As I’ve started to really get into cooking, baking, and party planning, I just couldn’t bust out the tacky blow up red parrot that was once a staple at the event in good conscience. Instead, I opted for more of a grown up, summery, lady-like party. 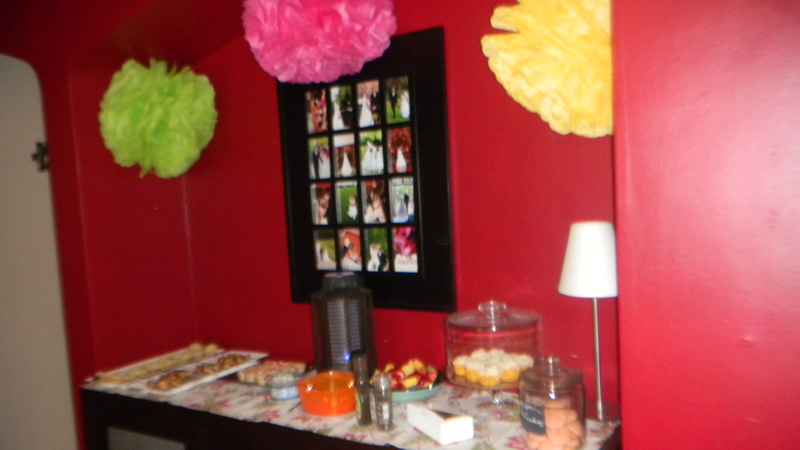 Here’s my party how-to, because you know I like to share all the gory details. I decided to still keep some Hawaiian touches, as a nod to the party’s beginnings. 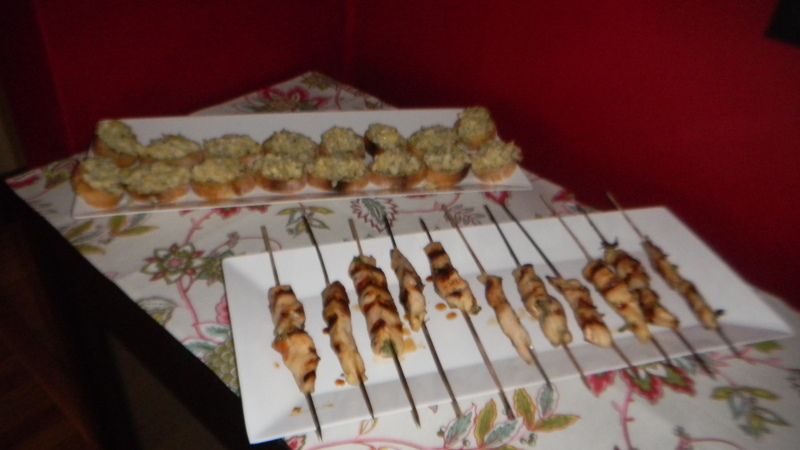 For instance, I served grilled margarita chicken skewers as the main dish, and dessert was a half batch of skinny pina colada cupcakes. Also for the first time this year, the event was hosted as a potluck. I made artichoke parmesan crostini, the skewers, and the signature drink (pomegranate margaritas), and guests each brought something to share. As a general rule, I don’t like asking guests to bring anything to a party. But, this was kind of always “our” event, and my guests oh-so-kindly volunteered to help out, since I’ve had a lot going on the past couple weeks in terms of weekend events. I happily accepted their offer. For decorations, I kept it super simple. 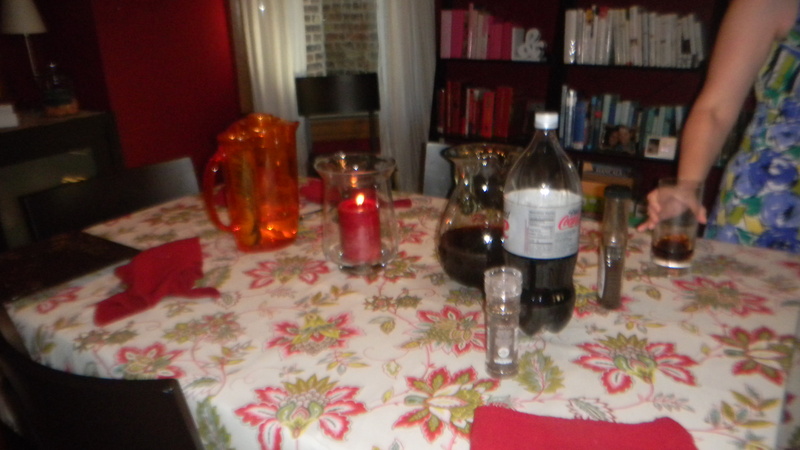 Since we didn’t have an outside space, I set up our dining room table so we could all eat there. The table cloth came from Homegoods, I believe for $14.99. I have matching napkins, but after seeing them on the table, I decided there was matched pattern overload. Instead, I used the napkins to create a runner on the sidebar by the food. 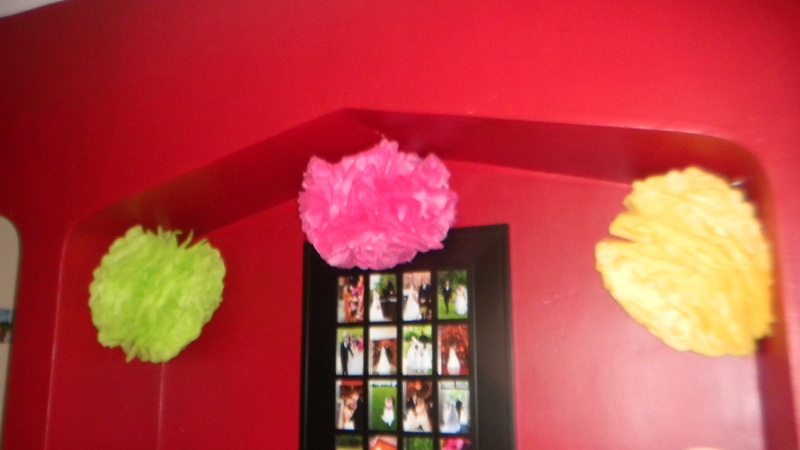 On the sidebar, I created a few flowery poofs made out of tissue paper. You can see how I did it by viewing Martha Stewart’s tutorial here. I kept the table decoration simple because of the busy tablecloth pattern and used a red candle (got it for free from Pier 1!) in a hurricane jar. Too bad I didn’t take a photo before the party started. Instead, I’m left with only the after shot. I set the table using, get this, my wedding china! Yep, Dan gave in and let me register for the most traditional of all wedding gifts. Ours is made by Lenox in the Twirl pattern. I make it a point to bring out the china pretty often. Ours is more durable than most, and get this, it can even go in the dishwasher! So I bring it out whenever I think of it. Why get wedding china if you’re never going to use it? Life’s too short to keep your pretty wedding china in a box, or even worse, in a curio cabinet, all the time. Finally, I put our Miguel Margarita Glasses from Crate & Barrel. First time I got to use my glasses and pitcher set. All in all, it was a most successful party. I had a great time with my girly-friends. 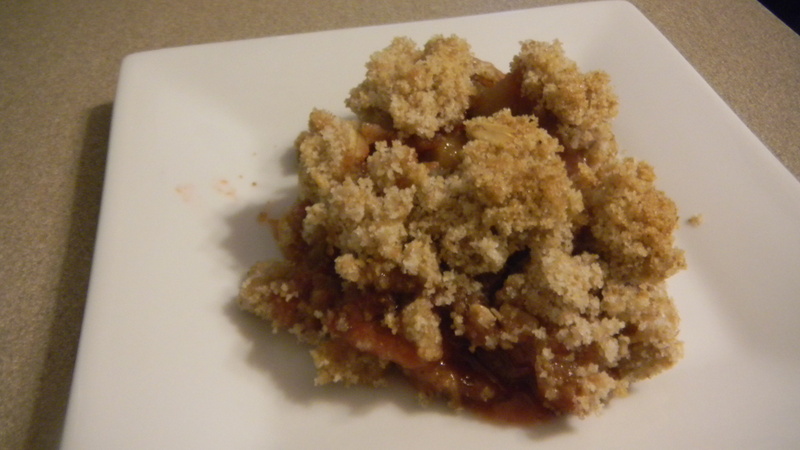 A little while back, Dan sent me a recipe for a quick and easy grown up snack. He figured if I had the recipe, there was a much better chance of it ever being made than if he alone had it. I’ll admit, it looked like it would be quite tasty. I finally had the chance to make them when a couple friends came over for a little backyard wine party get together. Here’s how they came out. I followed most of the directions from the article, but I did change it up a bit. 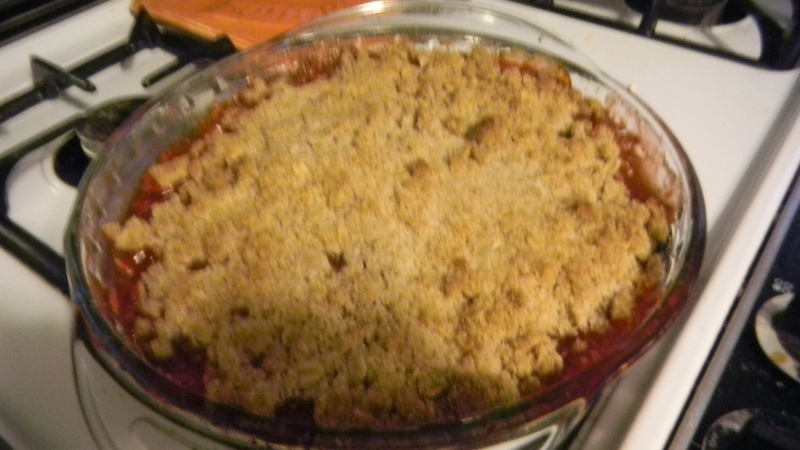 For starters, we used nectarines instead of peaches since that’s what we had on hand. We sliced them, dipped them in the honey-water mixture, and grilled each slice on both sides. We deviated from the recipe with the crostini bread. We bought a regular baguette from Trader Joe’s, and i cut it into small slices. 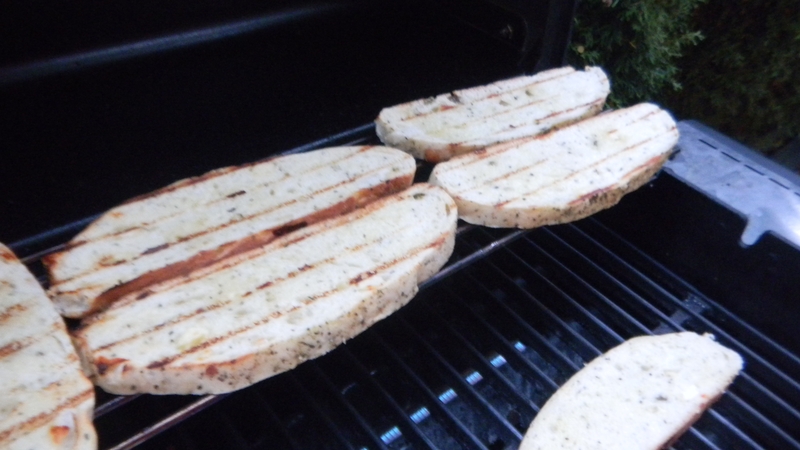 I brushed a thin coat of olive oil on each side of the bread, and then on to the grill it went. 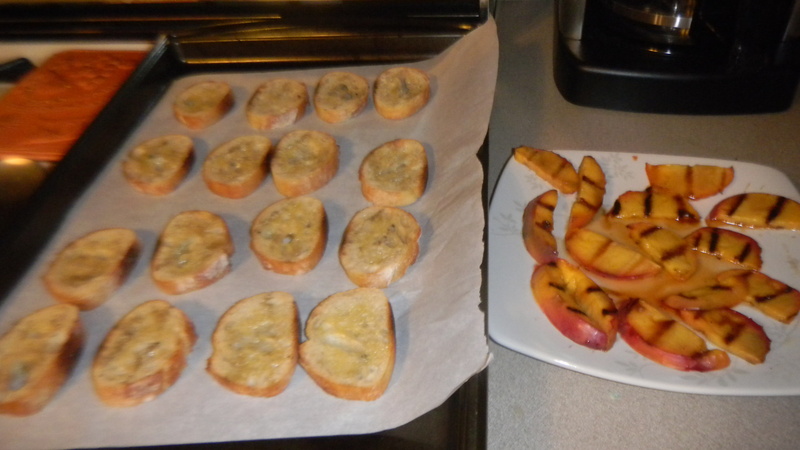 As we did for the nectarines, we grilled each piece of bread for a short time. Be careful not to leave them on there too long, or they will be scorched. I took every thing off the grill and put it aside until it was almost time to serve them. Allow yourself about ten minutes of prep time before you need them. 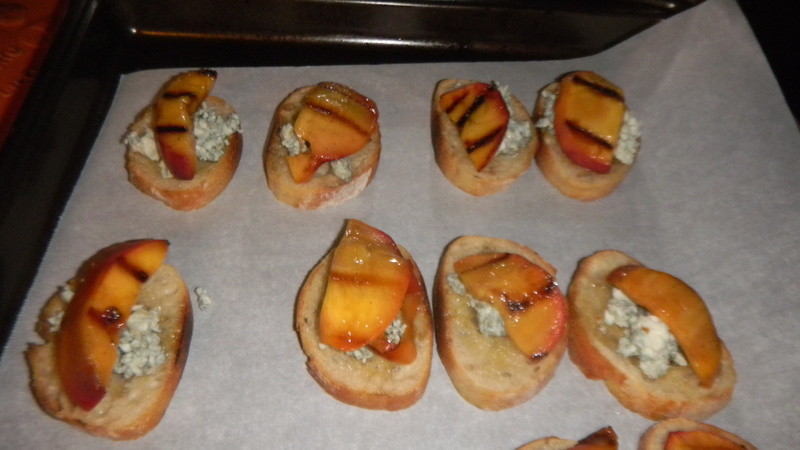 I put about one teaspoon of bleu cheese onto each crostini and topped it with a nectarine slice. 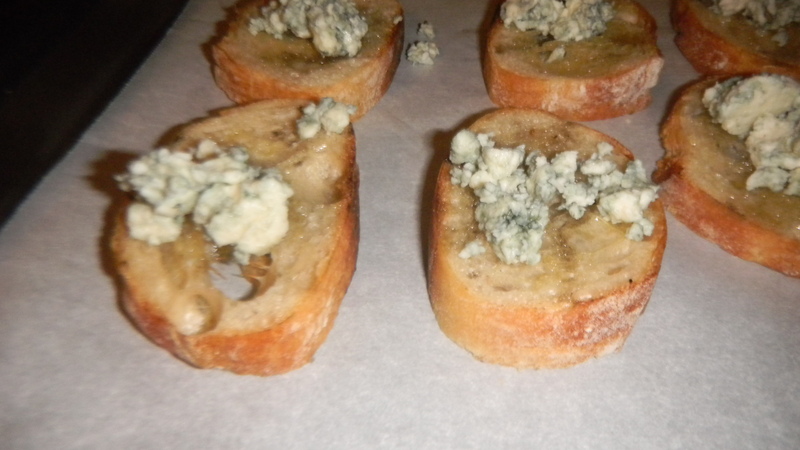 I baked them on a baking sheet only until the bleu cheese got melty, which was only a few minutes. 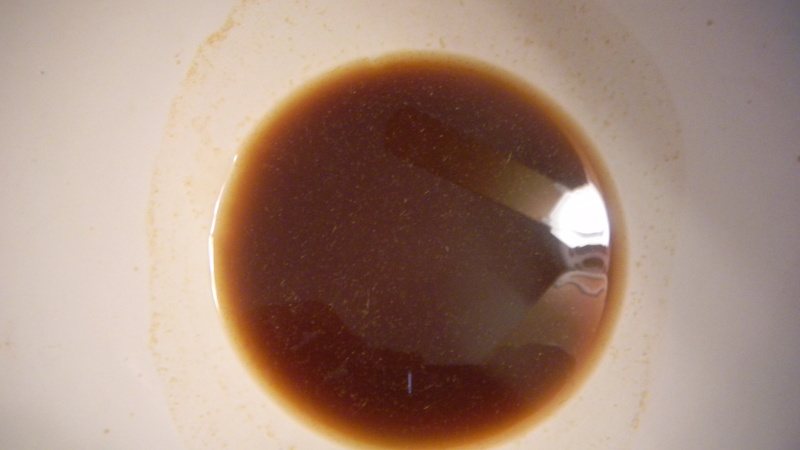 I took them out of the oven and glazed them with the remaining honey-water mixture. Finally, they were ready. 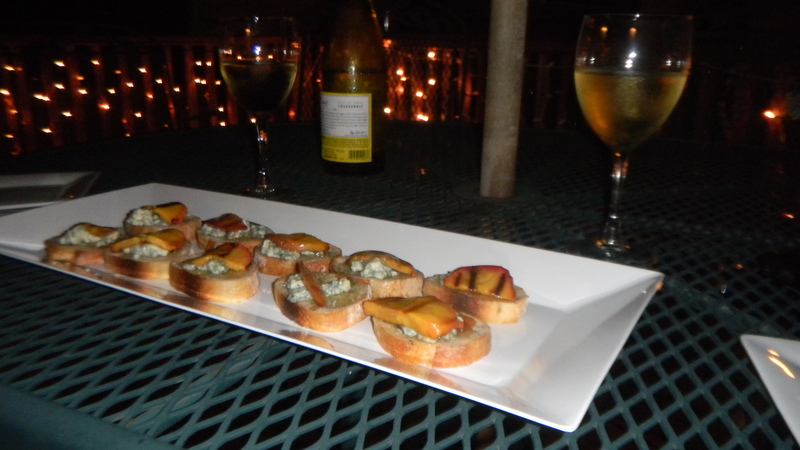 We took them outside and enjoyed them alongside Cupcake Chardonnay, which my friend Lauren brought to share. They paired very nicely. I highly recommend it.